The management of multi-cat households requires attention to the art of feline care. The considerations are organized into 10 Commandments that cover space layout, intra-cat behavioral considerations, food distribution, water sources, play opportunities, litter boxes, resting places, scratching opportunities, urine marking, and outside areas. Whether a client lives in a large house or a studio apartment, there are several ways to provide more room for cats living together in a household. For example, once horizontal space (square footage) has been maximized (Figure 1), vertical space can be added by installing perches and placing cat “condos” or “trees” in the home (Figure 2). An online search on the term cat furniture provides information and photos that give owners ideas on how to make their households more cat friendly. Consider incorporating some of these ideas into your practice as examples. 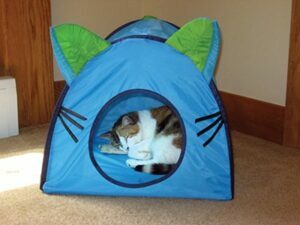 Expansion to the outdoors—using special cat fencing or enclosures—can be an option as well (see 10. Consider Outside Spaces). Cats are social, but their societies are insular. If a cat is raised individually and then brought into a group of cats, management of social interaction is more difficult. Introduced in pairs (similar ages; preferably related or already familiar with each other), which allows the pair to interact together, reducing the chance the newcomers will aggravate the other cats. The occasional hiss, growl, and tussle—which are common behaviors and part of the normal feline social repertoire—are expected and normal. However, if one cat begins stalking another or a cat starts hiding and is reluctant to emerge for food, attention, or litter box use, behavior problems may ensue. Cat grass and catnip provide natural options for feline treats and entertainment. 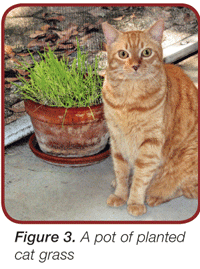 Encourage owners to keep fresh cat grass (typically a mix of oat, wheat, and rye) in large, sturdy pots around the house (Figure 3). it takes about a week for grass to germinate and it is edible for 2 to 3 weeks. Fresh catnip is usually available at nurseries; dried catnip can be found in toys or loose. it can be sprinkled onto throw rugs for cats to roll in. Providing a variety of food puzzle toys that challenge the cat both mentally and physically to extract the kibble. While “free feeding” can be a concern in overweight or obese cats, research has shown that meal-fed cats tend to be more aggressive and less cooperative than those fed free choice.2 As always, the goal is to strike a balance, such as free feeding smaller amounts of food and using automatic feeders that provide food throughout the day. The latter keeps the cat “grazing” versus consuming all available food at once. Particularly prefer water from a tall receptacle, such as a sturdy flower vase. 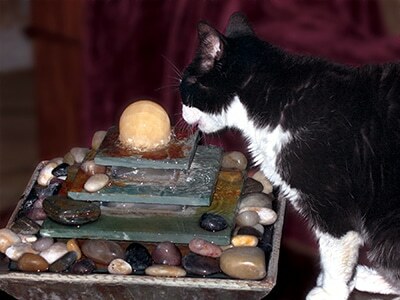 Prefer a flowing water source to one that is still; therefore, providing a fountain—whether designed for cats or humans—in the home is recommended (Figure 4). Like to use faucets to access flowing water as well. In multicat households, it is not uncommon for 1 or more cats to prevent access to important resources, such as food, water, and litter boxes. Make sure owners provide several locations for these resources in order to prevent feline confrontation and stress. Everyone agrees that kittens play—often very roughly, and play is also an important part of the daily lives of adult cats. This play includes interacting with each other and/or “their” humans. The opportunities cats had as kittens to engage in “appropriate” play may determine how they behave as adults. A study demonstrated that hand-reared kittens were no more likely than queen-raised kittens to develop behavior problems or display human- and conspecific-directed aggression and fear.4 However, the hand-reared kittens did have another cat in the household and at least 1 wand-type toy for interactive play. Cats can use to play on their own. Appropriate play refers to providing interactive (and safe) cat toys that kittens and adults can play with on their own, with each other, and with their owners. Without appropriate toys, kittens redirect their play toward other cats and/or owners’ hands/feet—behaviors that should be avoided before they become learned. In an outdoor environment, cats have plenty of room to eliminate, often digging down a good distance to do so. 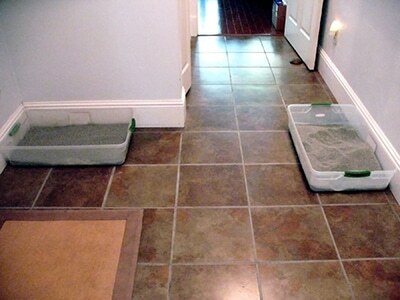 These considerations should be taken into account when teaching owners about ideal litter box setup. Size: Boxes should be large—ideally the size of plastic boxes used for under-the-bed storage—and placed in areas that are easily accessible (Figure 6). Number: The typical rule is 1 box per cat plus 1 additional box. 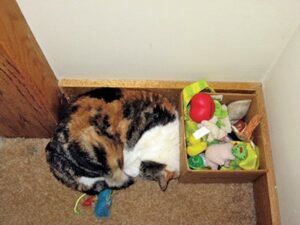 However, owners can consider using fewer boxes if large boxes are chosen and their cats coexist peacefully. In an older study by Panaman,6 cats rested 22% (5.3 hours) of the day and slept 40% (9.6 hours), which conservatively translates to almost 15 hours of rest/sleep per day. Therefore, cats need places in the house where they can “rest in peace,” especially if there are cats of different ages in the environment (Figure 7). The goal is to provide as many resting places as possible in various parts of the home. Resting places include perches, individual beds, and designated furniture. Again, owners can search online for ideas. Cats scratch to communicate with other cats—if a tree or dirt isn’t available, then a chair or rug will do. Indoor cats need a variety of scratching options—both vertical and horizontal (Figure 8). Scratching surfaces should be located in central, visible areas of the house because they serve as a form of feline communication. If possible, include a surface that a cat would be naturally attracted to outdoors (ie, a log). 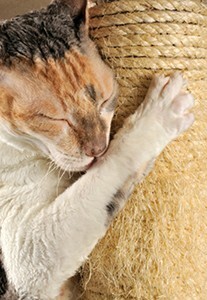 Increase the appeal of scratching surfaces by sprinkling or spraying them with catnip or Feliway (ceva.com), respectively. To prevent cats from scratching furniture, double-sided tape, such as Sticky Paws (pioneerpet.com) can be used as a deterrent. If furniture scratching cannot be tolerated, nail covers, such as Soft Paws (softpaws.com), can be applied to the cat’s nails. To help set everyone up for success, make sure your patients’ nails are trimmed regularly. Prevention: Owners can help prevent urine marking by remembering Commandment 1: the home environment needs to provide plenty of space for all cats. Management: If a cat begins to mark, there are a number of therapeutic options available, including anti-anxiety medications (eg, fluoxetine, clomipramine, buspirone), pheromones (Feliway) and, as a last resort, progestins. For more detailed information on urine marking, read Dr. Ilana Reisner’s article, Diagnosis and Management of Feline Urine Marking (March/April 2012 issue of Today’s Veterinary Practice), available at todaysveterinarypractice.com. 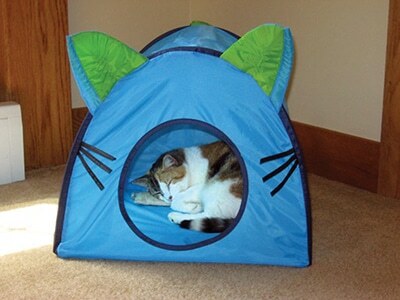 Because space is essential in a multicat household, it can be expanded to a safe area outside. A safe area is one that is fenced specially for cats, keeping them within the enclosure and other animals or threats out. Fencing options include Purr…fect Fence (purrfectfence.com) and Cat Fence-In (catfencein.com). These fencing systems are relatively easy to assemble, and can be conformed to existing fencing or built around an area of the owner’s choosing. Outdoor fencing is an especially good option if you are merging groups of cats, providing plenty of space for all cats. Make sure to effectively communicate these commandments to owners with multiple cats as well as ensure they are implemented consistently in the households. Communication and follow-up are critical keys to success. 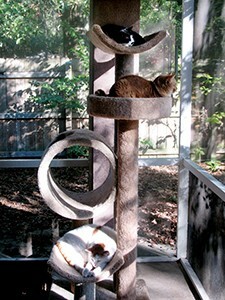 Have owners evaluate their homes’ layouts if they have more than 1 cat. if possible, there should be more than 1 entry/exit point to each area of the house in order to prevent a cat from trapping/cornering another cat or preventing access to resources. Wolfe RC. The Social Organization of the Free Ranging Domestic Cat (Felis catus). PhD dissertation, University of Georgia, 2001. Beaver BV. Feline Behavior: A Guide for Veterinarians. Philadelphia: WB Saunders, 1992, pp 181-182. Pachel C, Neilson JC. 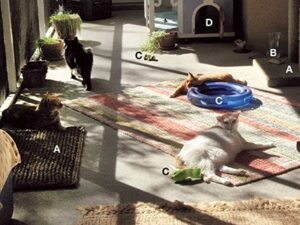 Comparison of feline water consumption between still and flowing water sources: A pilot study. J Vet Behav Clin Appl Res 2010; 5(3):130-133. Chon E. The effects of queen (Felis sylvestris)-rearing versus hand-rearing on feline aggression and other problematic behaviors. Intl Vet Behav Meet Proc, 2005, pp 201-202. Neilson JC. Feline house soiling: Elimination and marking behaviors. Vet Clin North Am Small Anim Pract 2003; 33(2):296. Panaman R. Behaviour and ecology of free-ranging female farm cats (Felis catus L). Zeitschriftfür Tierpsychologie 1981; 56:59-73. Feldman HN. Methods of scent marking in the domestic cat. Can J Zool 1994; 72:1093-1099. Hart BL, Barrett RE. Effects of castration on fighting, roaming, and urine spraying in adult male cats. JAVMA 1973; 163(3):290-292. Beaver BV. Feline Behavior: A Guide for Veterinarians. Philadelphia: WB Saunders, 1992, p 209. Terry Marie Curtis, DVM, MS, Diplomate ACVB, is head of the Clinical Behavior Service at the University of Florida College of Veterinary Medicine and also makes house calls in Florida and South Georgia for behavior-related cases. Dr. Curtis is the author of a number of peer-reviewed articles, including book chapters in Veterinary Clinics of North America and Blackwell’s Five-Minute Veterinary Consult (5th ed). She regularly lectures at the NAVC Conference, is coordinator for its day-long behavior symposium, and has appeared on ABC’s Nightline and NBC’s Today Show. Dr. Curtis received her DVM from University of Florida and completed her veterinary behavior residency and MS in psychology at University of Georgia.